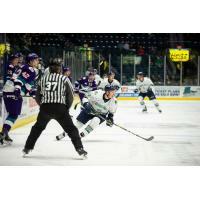 ESTERO, Fla. - Having clinched the South Division regular-season title, the Florida Everblades (45-16-5-0, 95 pts.) set their sights on wrapping up the Eastern Conference title when they host the Orlando Solar Bears (35-23-4-1, 75 pts.) on Saturday night. Derek Sheppard (1g-2a), Matt Finn (1g-1a) and Blake Winiecki (1g-1a) all posted multiple points, but the Everblades saw their eight-game winning streak come to an end in a 6-4 loss to the South Carolina Stingrays on Sunday afternoon. Despite losing to the Stingrays, Florida scored twice on three power-play opportunities in its final road game of the regular season and finished with what is currently a league-best 23 road victories. Sam Warning (FLA) - Warning is expected to make his season debut on Saturday for the Everblades after missing the first 66 regular season games while on the Injured Reserve. The Chesterfield, Missouri, native played the bulk of three seasons with the Quad City Mallards before he was acquired by Florida late in the regular season last season. Warning went on to tab 14 points (5g-9a) in 21 games for the 'Blades on their run to the Kelly Cup Finals. Trevor Olson (ORL) - The University of North Dakota product is tied for the team lead with 10 points in head-to-head matchups with the Everblades this season. Olson, who is in his first full season of professional hockey, has registered 16 goals and 32 points in 51 games this season. He has tabbed multiple points in six contests this year. Saturday is the 11th of 12 regular-season meetings between Florida and Orlando this year, and each of the last two matchups come at Hertz Arena. Florida is 5-3-2-0 against Orlando this season, including a 2-1-1 mark at home. The 'Blades hold the edge in the all-time series with a 60-24-6 mark against the Solar Bears in the seven seasons Orlando has been a member of the ECHL. Rookie forward Blake Winiecki has stepped to the forefront since the Everblades lost captain John McCarron and alternate captain Joe Cox to AHL call-ups the week of Feb. 25. Winiecki has points in eight of his last 10 games, with four multi-point games over his last six contests. He ranks sixth among ECHL rookies with 53 points (23g-30a). Sunday's loss against the Stingrays was the first time this season the Everblades have scored four or more goals and fell short of victory. Florida's record in such contests is now 37-1-2 for the season, while the 'Blades are 44-2-4 when they have notched three or more goals. Florida's power play has scored in bunches lately. Through the first 49 games, the Everblades scored multiple power-play goals in the same game on just five occasions. Since that 49th game on Feb. 9 against Adirondack, Florida has converted on multiple power plays in the same tilt nine times. The 'Blades season-high for power-play goals in a game is three, which they accomplished on Jan. 9 against Greenville. Florida can clinch the Eastern Conference regular season title on Saturday night with some help from around the ECHL. With a Reading win in regulation over Newfoundland and an Everblades victory of any kind, Florida will wrap up the Eastern Conference. The 'Blades clinched the South Division title thanks to Orlando's loss on Tuesday to Idaho. The Everblades host the Norfolk Admirals in a three-game set this coming week, the second-to-last week of the regular season, with games on Wednesday, Friday and Saturday. Ticket packages for the 2019 Kelly Cup Playoffs presented by Smile Direct Club and 2019-20 Season Tickets and Flexible Packages are on sale now! Join the FUN and 'Blades FAMILY by SAVING with Season Tickets or a Flexible Package that fit into your schedule and budget, plus receive FREE gifts and benefits! SPECIAL OFFER! Purchase a new Season Ticket or Flexible Package for the 2019-20 season and receive a $20 gift card to Ford's Garage and an Everblades tote bag! Private tours of Hertz Arena are available to select your season seats! Call the Florida Everblades Front Office at 239-948-7825 to schedule your tour today!